Sponsorships, donations, and advertising revenue all help the Oakville's Recreation and Culture department to deliver services and host special events for the community. Businesses, groups and individuals can provide support through the Community Partnerships Program and naming opportunities (special events or at Sixteen Mile Sports Complex). Advertising options include program guide advertising, arena boards and digital signs. We are now taking submissions for the Fall and Winter program guide! NEW! Buy an ad in our program guide and get a digital screen ad FREE for the month of your choice. The Parks, Recreation and Culture program guide is published twice per year – in July and January. To be included in the Fall and Winter edition, submit your file, form and payment by June 3, 2019. Click on the Advertising in the Parks, Recreation and Culture program guide heading that follows for forms and details. Now you can advertise (static image or video) on the big screen at centre ice in Sixteen Mile Sports Complex's Olympic-sized ice pad during weekly programs and special events! Click on the headings that follow and use the links provided for more information about advertising and sponsorship opportunities. The Recreation and Culture department is pleased to offer CORE members special rates to advertise in the semi-annual program guide, and on arena boards and digital screens in our facilities. If you are a member of a non-profit, volunteer-based community organization, visit the CORE page for more information. The Community and Corporate Partnerships program forms partnerships between the Town of Oakville's Recreation and Culture department and community businesses and organizations. Essential services are funded through the town; however, sponsorships, donations and advertising revenues make it possible for the town to expand its programs, services and initiatives while reducing the need for tax increases or additional user fees. Enhanced programming at the Oakville Centre, including some free and pay-what-you-can performances. Naming opportunities are available for the interior spaces at Sixteen Mile Sports Complex including ice surfaces, dressing rooms and multipurpose rooms. Download the complete Sponsorship Information package (PDF) for more information. Please email Janine Ivings at janine.ivings@oakville.ca or call 905-845-6601, ext. 3080, if you have any questions or to learn how you can get involved. Sixteen Mile Sports Complex is Oakville’s state-of-the-art quad pad arena complex located in north Oakville. Recently, a video scoreboard (90 inches tall by 96 inches wide) with high definition capabilities was installed to enhance the customer experience and increase the profile of the facility, which hosts numerous sporting events throughout the season. 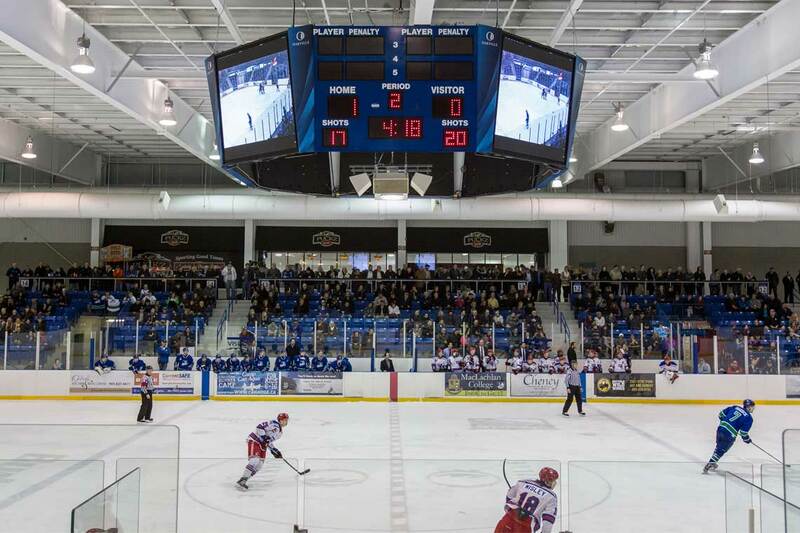 Now you can advertise (static image or video) on the big screen at centre ice in the Olympic-size rink during weekly programs and special events, including hockey tournaments, Skate Canada Championships and Oakville Blades home games! Weekly, monthly and annual rates are available for various plans including the Major Events Package or Oakville Recreational Hockey League Package. Open the Sixteen Mile Sports Complex Scoreboard advertising information booklet (PDF) for more information. Showcase your ad in full colour for no extra cost! The Recreation and Culture department produces two program guides per year. We accept advertising submissions for the Spring/Summer edition, distributed in January, in October. And, advertising for the Fall/Winter edition, distributed in July, is accepted in May. Download the Corporate Fall and Winter program guide advertising submission form (PDF) now for rates and fees, specs, and more. Your form, ad file, and payment must all be received before June 3. Space will not be allocated for incompete submissions. After the deadline, ads will accepted first-come, first-served, only as space allows. Added bonus – FREE digital screen ad! NEW! Book an ad and get one month of digital screen advertising ($157+ value) free on all of our screens during the month of your choice! Advertisers will be contacted to make arrangements for submitting their digital screen ad. Click on the Advertising in our facilities heading for more information about screen locations, etc. The town's Parks, Recreation and Culture guide (PDF) continues to be one of Oakville's most sought-after guides for program information. Advertisements are placed in the easily located advertising section of the guide with a direct link to your website. Please note: First-come, first-served. If applicable, a waitlist will be started once current spaces have been filled. Space will not be reserved for incomplete submissions. If you are you a CORE member wishing to advertise, or a not-for-profit organization and want more information about CORE, please visit the CORE page. To be added to the contact list regarding advertising in the program guide, please email brochure@oakville.ca. Please note: We have new size requirements. Please open the Brochure Advertising Sizes – Corporate (PDF) for examples. Opportunities to advertise on the Parks, Recreation and Culture guide covers are also available. Download the Corporate Advertising Rate Sheet (PDF). Advertising space is limited and submission before deadline date DOES NOT ensure ad placement. The Town of Oakville holds the right to judge acceptability of ad subject and quality. Advertising submissions will not be accepted until both payment and acceptable electronic artwork have been received. Advertising space cannot be reserved. For more information on brochure advertising, please contact Joanne Locker at 905-845-6601, ext. 3147 or brochure@oakville.ca.